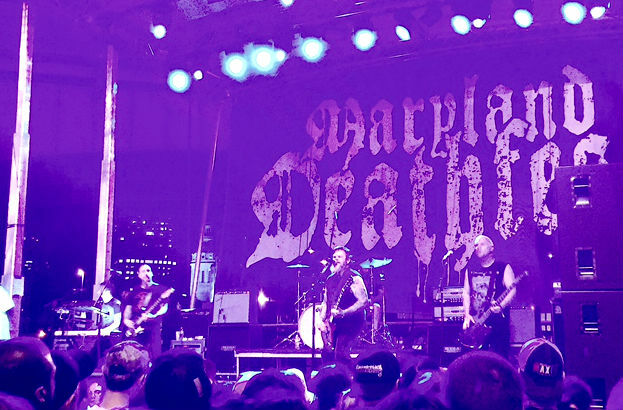 There are a lot of fantastic performances every year at Maryland Deathfest. Bands tend to bring their A-game; being tight and well rehearsed is a given, and most bring as much energy and enthusiasm to their sets as they are capable of. But every once in a while, something genuinely extraordinary happens, a combination of the band and the crowd, the mood of the performance and the quality of the environment, and the ineffable, magical quality that sometimes lifts live music and allows for something transcendent to occur. Neurosis' performance was one of those sets. The sound quality was a significant part of it: loud and enveloping, every loop of their elliptical song structures seemed to settle more heavily on the crowd, like a boa constrictor tightening around its prey. The setlist was unusual too, characterized by heavier emotional numbers like "Times of Grace" and "Stones From The Sky" that seemed specifically designed to leave the audience raw and wrung out. As each element of the performance hit the audience in shuddering waves, it was impossible not to feel that something transformative was taking place; looking through the crowd, many faces were wet with tears.